An overview of the latest techniques on computer graphics to model realistic water and fire is given. These fluid models are based on a simplification of the Navier-Stokes equations. Some of the most important applications represent real life problems solving as water flood, real fire situation, firemen training and others. Regarding water modeling, there are compared the different approaches, volume modeling or surface modeling. Situations as the immersion of an object into water are analyzed and the physical characteristics of water, such as light reflection/refraction are mentioned. In fire modeling the physical characteristics are analyzed, but also the chemical contribution for a more accurate model of fire, which includes smoke and radiance. The two different models are compared, from the point of view of both having a fluid like movement, as implicit surface models and particle systems employed in these analyzed approaches. Keywords: stable fluids, animation of fluids, Navier-Stokes equations, implicit surfaces, physical phenomena. 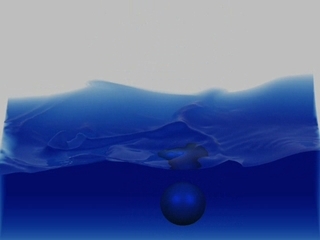 The contribution of this work is to make an overview of the present techniques of modeling on computer graphics realistic water and fire effects. The previous work on the field is revised, introducing some of the possibilities that exist for modeling water and fire. Then the motivation is presented to model water and fire, a survey is made over the applications and importance of modeling this phenomena. Presentation of the latest techniques for modeling water, using a simplification of the Navier-Stokes equations for fluid, with more incidence over the technique from [Foster and Fedkiw 2001] and [Enright et al. 2002]. Also the [Nguyen et al. 2002] technique on fire modeling is discussed. A brief comparison between the similarities and differences of modeling water and fire is made, we present some of our experiences in water and fire modeling using Maya Dynamics [Maya 2002], finalizing with conclusions. There are two main reasons that motivate modeling realistic water and fire. One is the fascinations of this two natural physical phenomena; another is the vast number of applications. Water and fire are two of the four ancient "basic elements", deeply surrounded by many meanings, concepts and interpretations. First of all, water and fire address automatically our first signal system. Water addresses directly our survivor instinct. Without water the human being would not exist. Water is one of the primary needs of the organisms. But can also signalize an alarm for possible danger. When revolt water is seen, or when the level of the water is increasing, or any abnormal water movement, one can feel insecure. The sight of water can be fascinating due to the fact that it causes a certain projection of human emotions. Fire also addresses directly to the surviving instinct. At the first glance, fire is a threat and the first reaction is protective, but when the symbolic cognitive system starts working it alerts to the use of fire. Fire can be seen as a warm place, it can be also understood as light source and a safe place. Also in this case we have the duality between danger and protection. There are a lot of reasons for modeling, in a realistic way, water and fire, but maybe the most important one is for having a better understanding of natural/physical phenomena. It means that it is easier and safer to study fire with computer than to study real time, full interaction fire. No one would like to go into the middle of the fire and work there; neither could survive in such environment for a long period. The same applies to water phenomena. But a great work can be done with simulation of fire environment. As an example, with the simulation of fire conditions using a realistic fire model, with all the physical and chemical properties of fire and including all the interactions with the surrounding environment, it is possible for firemen study the possibility of better locating fire signs, fire alarms, fire extinguisher and plan better fire exit distribution and fire exit path even before the infrastructure is built. Also with the help of immersive virtual reality firemen can be trained in a better and more realistic way to face the possible danger that they can encounter on the exercise of their daily work. This is a danger free situation, with a significant improvement of the learning and training process. Talking about water, the same can be applied, as an example, sea stream interaction and influence on sea shore structures can be predicted, also the impact, on the sea streams and surrounding environment, of building a sea shore on a specific place on the coast line can be predicted and studied. Studies for the usage of other technologies such as wave movement based machines for producing energy are also possible when a good model is produced. Another reason, and perhaps this is the most lucrative one, is the film and game industry. When in the scenario a realistic rendering of fire or of water exists, the illusion is more complete and the audience is keener to like and get immersed in the movie or the game. Films as Final Fantasy or Shrek are two of many success stories within movie industry. 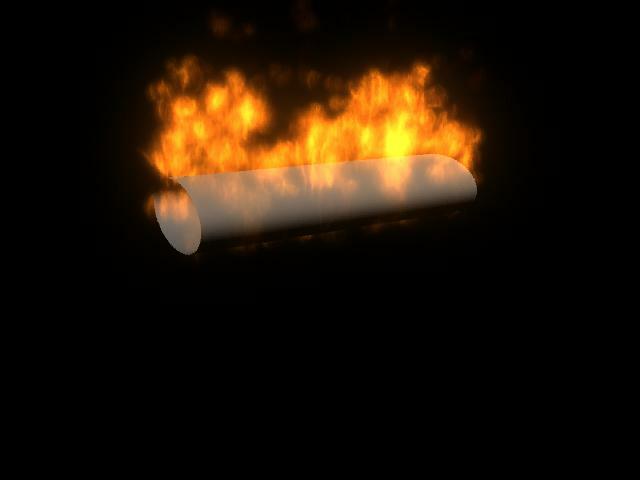 Computer graphics effects were used and modeled water and fire were created to give even a more realistic touch on the scene. Other reason for virtual reality usage, which could also be mentioned together with the previous ones, is its particular interest and development. Virtual reality as its own software and hardware characteristics and so modeling realistic water and fire demands harder work, but usually the final result can be more appealing to the viewer. There is lot of engineering applications for modeling realistic water and fire, some were mentioned before, as fire interaction and water interaction knowledge and comprehension, for disaster prevention and energy production. But this modeling can help education also permitting a better visualization of the knowledge and - last but not least - a better understanding. The Navier-Stokes equations, discovered in the beginning of the eighteenth century, describe the behavior of a liquid volume with such precision that a huge amount of researches have been made with the objective of solving and applying them on a wide range of engineering solution. The usage of the full 3D Navier-Stokes equations on complex water effect simulation was done in the last 50 years. Continuing the long time work done by other researchers [Foster and Metaxas 1997] developed a 3D Navier-Stokes methodology for controlling fluid animations using an embedded controller concept. [Stam 1999] proposed an unconditionally stable model using the Navier-Stokes equations for interactive modeling of fluid-like animations, such as gaseous phenomena. [Foster and Fedkiw 2001] combine a modified semi-Lagrangian method with a new approach to calculate fluid flow around objects. They used implicit surfaces to better represent the interaction between liquid surface and penetrating object, obtaining so a far more natural fluid movement and representation. [Enright et al. 2002] presented a new particle level set method that combines implicit surfaces and marker particles. This improved the animation and rendering of fluid motion. With this method it is possible to animate phenomena as the wind blowing over the ocean, and to control complex refracting liquid surfaces. This is possible due to the fact of the particle movement in both sides of surface using extrapolated velocities. Based on the Navier-Stokes equations, using implicit surfaces and stable fluids, [Nguyen et al. 2002] were able to produce a physically based model for modeling and animating fire. This model represents the expansion that takes place when a vaporized fuel reacts to form hot gaseous products and the transformation of a solid fuel into gas state. Smoke, black body radiance and the blue core produced by the radical present in the chemical reaction zone are also taken in account. This model enables for interaction of objects and fire/flame and because the temperature of the interactive object is relative to the fire temperature it is possible to model the interacting object act as a solid fuel. The best approach for modeling realistic water and fire is using the Navier-Stokes equations. From the previous results we learn that a simplification can be used. The most important question is the conservation of the mass and the momentum. A stable solver was already acquired by [Stam 1999] and subsequently used by [Enright et al. 2002] and [Nguyen et al. 2002], obtaining very satisfactory results. In this section we discuss the Navier-Stokes equation, its utilization on modeling realistic water and fire and the models of [Foster and Fedkiw 2001], [Enright et al. 2002] and [Nguyen et al. 2002]. The Navier-Stokes equations for the representation of fluid motion are divided in two parts. The fist one describes the conservation of the mass, with the purpose of avoiding compression of the object. Where, u is the liquid velocity and ?= (d/dx, d/dy, d/dz).The second part takes into consideration the conservation of the momentum through the relation of the velocity and pressure fields. With the following equation it is possible to represent the variation on the velocity field resulting of the influence of the effect of viscosity (vis), convection, density (rho), pressure (p), and gravity (g), where Nabla stands for the Laplace operator. For deeper comprehension and study of the Navier-Stokes equations we address the reader to any standard book of fluid mechanics [Caffarelli et al. 1982] or to the official problem description [Fefferman 2000]. [Foster and Fedkiw 2001] proposed a six step algorithm for solving the Navier-Stokes equations making possible the representation of stable fluids. They had very good results in the means of graphical representation of fluid interaction with moving object, containers, and immersing object. This can be observed in Fig. 2. [Foster and Fedkiw 2001] start modeling the area where the liquid will interact, by defining a container, where the cells can be of two types, solid or empty (or unfilled). The liquid can only occupy the empty/unfilled cells. After this they represent the liquid presence in the space using implicit surfaces. The smooth surface is obtained by the utilization of a dynamic isocontour. Using the [Foster and Fedkiw 2001] method, [Enright et al. 2002] improved by introducing a new front tracking technique for water surface representation and a new velocity extrapolation for getting a better water surface effect, made possible to simulated a small wind perturbing the surface or to make the surface fast stabilize. The new approach introduced by [Enright et al. 2002], in opposition to the [Foster and Fedkiw 2001] model, is the surface modeling instead of the former volume modeling approach. The improvement can be seen in Fig. 3. This new technique makes possible to concentrate on the surface modeling which is easier to handle from the point of view that a point either is part of the object or from the air, even knowing that a frontier of an object is more difficult to define mathematically than it is the interior. Also now it is possible to make realistic water drop disconnected from the big water mass when the wind blows or on a water impact towards a fixed object. In the special case of the water dropping on a glass, deeply studied by [Enright et al. 2002], it is easier to make the water interact with the glass walls because as soon the a cell from the water surface tries to occupy a space already occupied by a cell from the glass wall, an impact is generated and the fluid dynamic is applied and so we can create a better physical movement. We refer to Fig. 5 for a better visualization. One of the most important characteristic of water modeling is the movement of the surface that influences all the refraction on the light when crossing a water surface. When using the velocity extrapolation introduced by [Enright et al. 2002] we can get better surface movements and so we can have a more realistic water surface. This is possible because this new extrapolation is made across the surface into the space occupied by the air. This way they got a better physically accurate and more visually appealing model. [Nguyen et al. 2002] introduced a technique able to handle both gas fuel and solid fuel for combustion, producing a realistic flame. [Nguyen et al. 2002] also model the blue core produced by the chemical reaction of the vaporization from a solid fuel. There is also taken in account the smoke produced by such flame, the soot rise influenced by the buoyancy. With this technique, it is possible to produce both smooth laminar and turbulent flames. (Fig. 4) The rendering was made with a Blackbody radiation model. This is a physically based model and so, factors as temperature changes, luminance and other physic phenomena are included in the modeling. 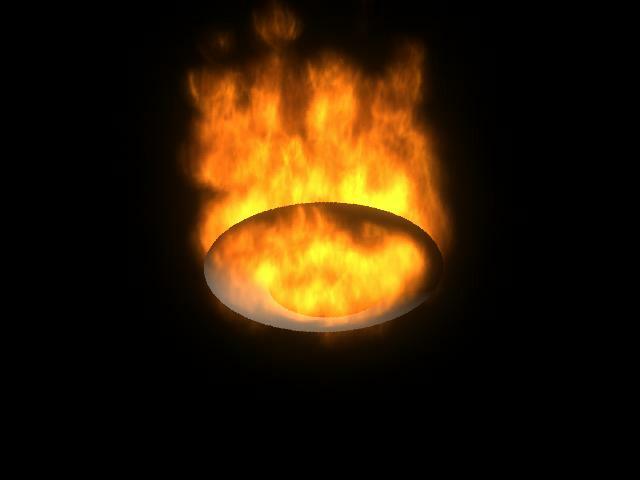 In result, is possible to make external object interact with the flame. With method by [Nguyen et al. 2002] it is possible to make an object intersect the flame and if one of the properties of this object is being a fuel, or a non-fire resistant, or inflammable object, then this object can inflame and the fire from the object interact with the initial flame (Fig. 6). In this case the object is treated as a normal solid fuel. 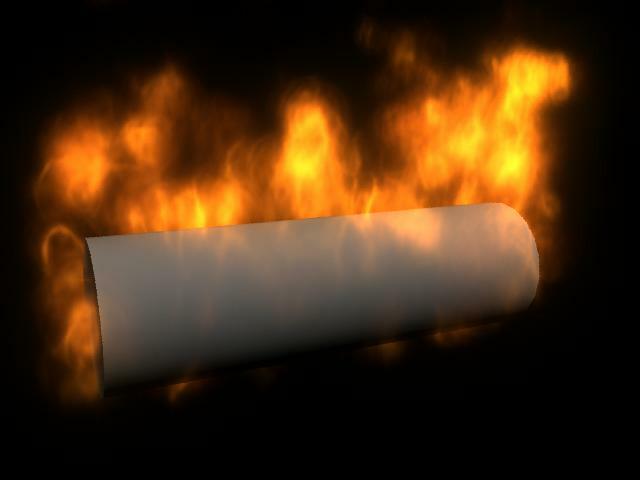 Due to the fact that the fire is modeled using particle systems, it is possible to model the path of the particle system and force it to flow around a non inflammable object. 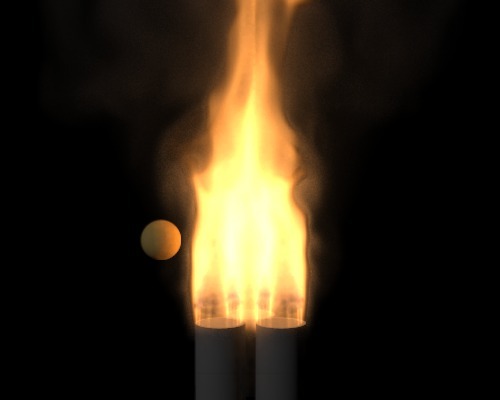 The hardest problem in modeling realistic fire is the incompressible flow of the flame. The flame movement is very hard to predict, that makes the modeling even more difficult. Water from the point of view of its physical and chemical properties has been deeply observed and studied, but from the point of view of the complexity of it representation on computer graphics, that is not so easy. For both water a fire model there is used a fluid-like movement. To have a physical accurate model is necessary to include in this fluid like movement external forces, as gravity, air resistance, air movement and so. In [Enright et al. 2002] and [Nguyen et al. 2002] for modeling water and fire, authors adopted the idea that both water and fire were implicit surfaces. This simplified the model. Also it was defined that both models use particle systems, due to the fact that it is a very good way of controlling and render both models. Another similarity between these approaches on modeling water and fire was the use of semi-Lagrangian approach for stable fluids. From other point of view, modeling water and fire is also very different in the method. 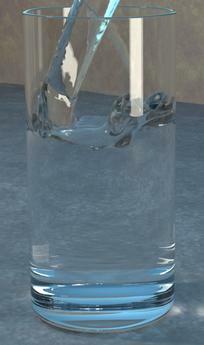 Modeling water implies using a computational fluid dynamics and water itself has specific characteristic, such as reflection and the tendency to stabilize the movement. On the other way, fire has its own particular characteristic, which have to be taken in account when modeling fire, such as it particular incompressible flow, the fact that the flame movement is unpredictable and instable. But maybe the most important characteristics that we have to take into account when modeling fire is that besides of being a physical phenomena, it is also a chemical phenomena. When we want an accurate model of fire we still have to model the smoke produced and the radiance of the fire, in conformity with the real model. All these characteristics make the modeling of realistic water and fire very hard, but with fascinating, amusing and fulfilling results. Our experience in modeling fire with the Alias/Wavefront Maya™ authoring tool was satisfactory. We started by using the introduction films and tutorial until we felt free to experiment further this authoring tool. After three hours we where able to produce simple animation and managed almost all the necessary basic functions of Maya™. Then using particle systems we were able to produce fire in a surface, a polygon and a NURBS, on a very fast, simple and realistic way. We rendered the model with the resolution of 640x480 and obtained the images in Fig. 1, Fig. 7, Fig. 8 and Fig. 9. These were the first images produced by us with the authoring tool Maya™ from Alias/Wavefront [Maya 2002]. Motivated by the good results in modeling fire, we moved further in modeling and experimented water modeling, but after another three hour the best result obtained is shown in Fig. 10. After the presentation of these techniques for water and fire modeling we got to the conclusion that this kind of models are very important, due to the fact of their applications in solving real world problems. The modeling of physical phenomena can certainly improve the quality of life and can solve real world problems. From our particular experience we noticed that fire is easier to model that water. But still there is lot to be done until we get to the stage that we have perfect model of the physic phenomena. We can be sure that there are a never ending applications for such models in both computer graphics and real world. This present work was made for evaluation on the lecture of AK Computer Graphics at the Institute of Computer Graphics and Vision, Technical University of Graz, Austria. I would like to thank Andrej Ferko and Markus Grabner for all their help and their precious orientation. CAFFARELLI, L. and KOHN, R. and NIRENBERG, L. 1982. Partial regularity of suitable weak solutions of the Navier-Stokes equations. Comm. Pure & Appl. Math. 35. 771-831. ENRIGHT, D. MARSCHNER, S. and FEDKIW, R. 2002. 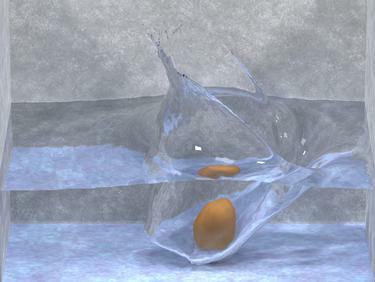 Animation and Rendering of Complex Water Surfaces. FEFFERMAN, C. L. 2000. Existence and smoothness of the Navier-Stokes equations. FOSTER, N. and METAXAS, D. 1997. Controlling fluid animation. In Computer Graphics International 97, 178-188. FOSTER, N. and FEDKIW, R. 2001. Practical animation of liquids. Annual Conference Series, ACM, 23-30. BROOKS, S. DILA, J. FORD, L. HUNTER, C. MACRI, C. PARK, S. RAMEY, D. ROSE, L. and STIVERS, M. 200. Using Maya: Dynamics. In Alias|Wavefront Using Maya: Dynamics, Version 3.0, 2000. NGUYEN, D. Q. FEDKIW, R. and JENSEN, H. W. 2002. 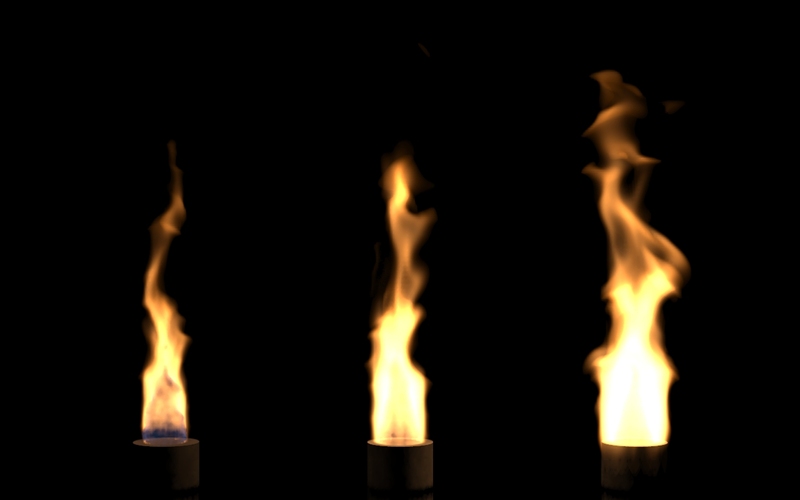 Physically Based Modeling and Animation of Fire. STAM, J. 1999. Stable fluids. In Proceedings of SIGGRAPH 99, ACM SIGGRAPH / Addison Wesley Longman, Computer Graphics Proceedings, Annual Conference Series, ACM, 121-128.